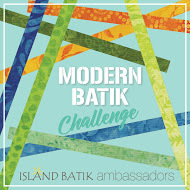 This month's Island Batik Ambassador challenge is to make a Modern Batik Quilt. For whatever reason I stumbled upon check marks when I was thinking about this project. I wondered what would happen if you stack them on top of each other going in opposite directions. I added an extra square to make the pattern feel more complete. The first thing I did was try out a few different colorations with markers. I had a bunch of beautiful green Island Batiks to use, but decided they didn't have enough contrast for a modern quilt. 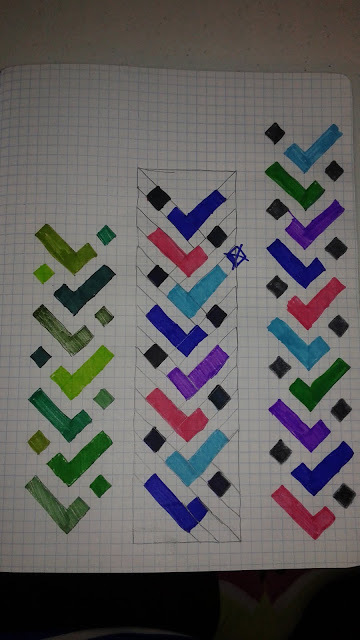 Then I tried different colors using a repeat of four colors and a repeat of five colors. I decided the scale of four colors worked better. Roland decided the pieces would make a great "boa" around his neck. The kid is a ham! Here you can see that I started with a central triangle and sewed strips to the right side, then the left side, then the right side, then the left, forever and ever and ever! Or at least it felt like it at the time because I had to iron after each piece. Here is the final piece with the last two triangles sewed on. Clearly I miscalculated their size. Oh well, too big is better than too small. Now since this is a modern quilt, I knew I needed to add negative space to both sides. So after squaring up the center "braid" I auditioned how to position it within the negative space. Below there is a lot of space on the right. In this option there is a more even amount of negative space on both sides. I decided to go with the first picture: a little negative space on the left and a lot on the right. I am fairly new to modern quilting. I must admit the more I do it, the more I love it, but I still love traditional quilting too. And art quilts for that matter! So for this quilt I decided I was NOT marking and I was just going to go for it and see what happened. I started with the straight lines following the checks. After doing 8 rows of that I'd decided I'd have enough and needed to do something different. So I did some more straight lines at the end of the quilt and decided to do something different in the middle. I forgot to engage the walking foot on my Bernina. Oops. In the photo below I didn't have it on and you can see what happened to the fabric. It ripples in some places. In the photo above I did remember to turn it on and the rippling was much less. Then I decided to fill the open areas at the ends of the quilt with free motion lines. I'm sure this has a name, but I am unsure of what that would be....if you know, please comment! First, I did a line of pebbles to separate and then echoed them once. The I did the straight line fill to finish the area. The taller the straight line fill, the harder it is to keep straight! Next I decided to try doing the straight line fill in alternating directions so that it looked like chevrons. It went well, but it's hard to know what it's going to look like when it meets up in the center. Finally I decided the third area was too wide, so I made a row of bubbles down the center and then did the straight line fill on either side of it. The bubbles really show up here with is fun! Finally I filled the center areas with a curl technique of Angela Walter's. I just watched her "Quilting Negative Space" class on Craftsy and I had to try it out. Overall, I am really happy with this little quilt I did for Island Batik's Modern Batik Challenge! It was fun and I'm excited to try more modern quilting, It was very freeing. Now I need to bind it. I must admit that I've been procrastinating on that. I actually have 3 small quilts I need to bind right now. I should get to that. Really I should. Someday soon.